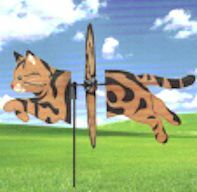 This spinner for your garden or patio features a brown tabby cat. The polyester cat is 19 inches wide. The spinner is 12.5 inches high. Comes with a 14" 6 mm fiberglass support pole. Assembly instructions included. The manufacturer recommends you bring the spinner inside during storms and harsh weather to protect its integrity.